It’s not hard to see the need to understand ourselves as the central motivation for art. Whether we’re talking about painting or sculpture, poetry or the novel, the fictionalization of reality—its depiction and abstraction, its reordering and refocusing—offers the chance not only to escape into someone else’s life, but a new lens through which to see ourselves and our world, a means to reckon with reality and our place in it. While this is undoubtedly true for an audience, it may be even truer for the artist himself. Not so much in terms of escape. After all, the artist is the master of his art; or, at the very least the essential force behind it. There are few surprises left for him after the creative process reaches its end. But during that process, in each stage from concept to completion, the artist has a chance (better put, an obligation) to try to understand himself, the world he lives in, and the new one he is creating. 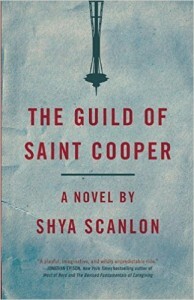 Shya Scanlon’s third novel, The Guild of Saint Cooper, is many things: a fractured metafiction about climate change and collective madness; a social satire about what’s left after society breaks down (after the workings of a city, here Seattle, all fall away); a hybrid of poetry and prose that uses its beautiful language to, in part, subvert traditional narrative. More than anything, though, The Guild of Saint Cooper is a meditation on reality and identity, an attempt by Scanlon to deconstruct and reimagine not just his world but himself. The book opens unassumingly enough, our narrator, Blake, greeting us from Seattle’s quiet, “post-evacuation” suburbia, a milieu that feels like one part Delillo, one part The Walking Dead, and a third part entirely Scanlon’s own, an absurd, paracomic slice of life that hints at the chaos to come. Soon tasked with rewriting the story of Seattle’s demise, creating an alternate history in which a fictionalized version of Dale Cooper (from TV’s Twin Peaks) will save the city from its imminent doom, the reality of Blake’s situation continues to degrade, begins to practically seethe with conspiracies he can’t quite grasp until they’ve overtaken him. Which seems fitting given the book’s focus on a conspiracy-riddled show like Twin Peaks. Equally fitting is this book’s lack of clean answers—every time a conflict seems resolved, the apparent resolution is proven to be a fraud, or at the very least a distraction. For that matter, even the book’s ending is ambiguous, Blake continuing (perhaps indefinitely) his search for Dale Cooper. Grounded as the narrative is in impending climatic disaster—the Ross Ice Shelf threatening to collapse any second creating a tsunami that will leave Seattle flooded and uninhabitable; the vaguely sinister Weyerhauser Corporation looming off-screen; and finally the alien lights that seem an obvious symbol for our obsession with energy—it’s impossible not to see this book as climate fiction. The question that presses, though, is to what end? With its sentient lights and obsession with creating a fictional history of heroism for a fictional representation of a fictional television character, The Guild of Saint Cooper is Scanlon’s statement about how we react in the face of crisis. Are we unable to do anything to stop our impending doom, only capable of finding what solace we can (or, if not solace, distraction) in reinventing ourselves and dissecting television shows, creating excuses (or again, perhaps only distractions) to keep us from focusing on our heart breaking reality? Scanlon certainly doesn’t excuse himself from this question. If The Guild of Saint Cooper is Shya Scanlon’s recreation of reality, our narrator, Blake, is his reconstruction of himself. From the fact that Blake is a young writer working on a follow-up to his earlier bookForecast (the title of Scanlon’s first novel) to his obsession with Dale “Saint” Cooper (Scanlon’s online Twin Peaks Project has been a focus for much of his creative energy), to the fact that Blake’s significant other is also named Blake, The Guild of Saint Cooper plays with identity, with notions of truth and authorship, self and celebrity. As much as any character in the book, Blake exhibits the obsession with distraction in the face of apocalypse, the desire to calm his own fears come what may for society. The question that looms over much of the book is what Scanlon is implying beyond this point. Is he suggesting we have limited agency in this, an inability to change our fate, that this need for distraction is unavoidable, terminal? Or, does he see hope for humanity (and himself), the idea that ridiculous as it may sound, our need for these distractions is actually linked to our ability to survive? As above, “The small gesture was mindless, but it occurred to me that if we were to find Dale Cooper at all, it would be in this way: through an automatic respect for the very real world around us.” Perhaps finding Dale Cooper is possible. More than that, perhaps the quest for him, or something like him, is what keeps us alive. There’s never a final answer given to this question, which is one legitimate test of intellectual fiction. Obfuscate too much and you lose your reader, perhaps prove that you’re not even sure what you mean. Become too didactic, too simplistic, and you lose your reader in another way, move beyond intellectual fiction into polemic. The happy medium is to provide some but not all of the answers. Which is what Scanlon does. He takes us to the water, but doesn’t force us to drink. The Guild of Saint Cooper is not a page-turner in the traditional sense. Still, it achieves and sustains momentum through the quality of its prose and the strength of its philosophy. 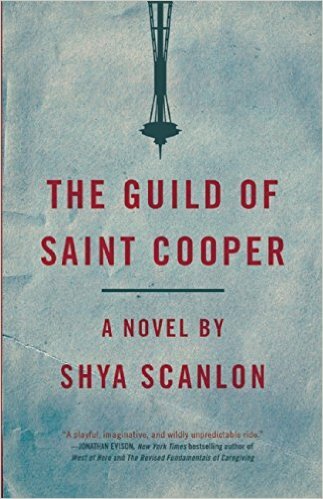 Which means that as full-bore literary fiction, there’s no way to see The Guild of Saint Cooper as anything other than a success. If you’re looking for a book that raises new questions on every page, that makes you think about yourself and the world we live in, here it is, the intellectual page-turner, The Guild of Saint Cooper by Shya Scanlon.